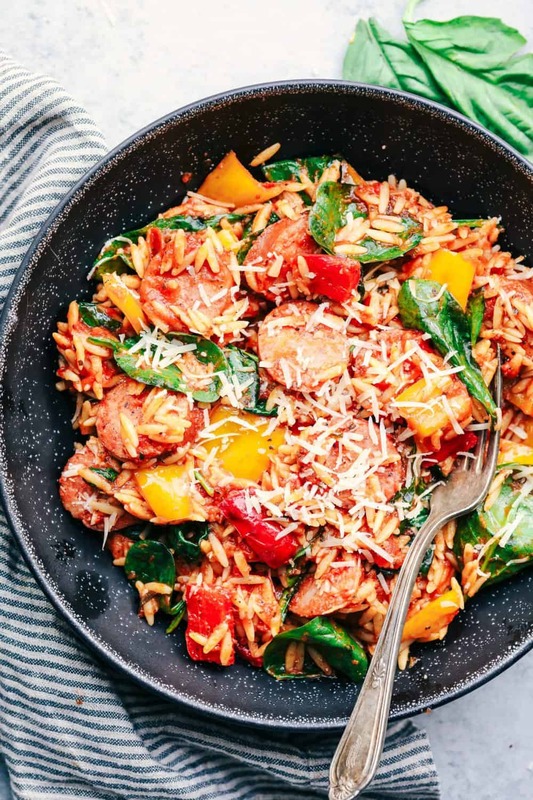 Italian Sausage and Vegetable Orzo Skillet is an easy to make dinner filled with sausage, peppers, spinach, and orzo all in a rich tomato sauce. 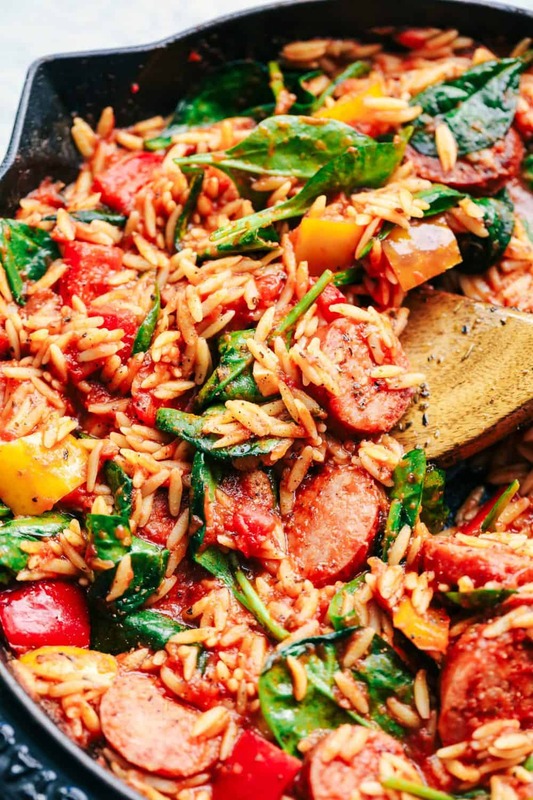 Made in one skillet with Italian spices, this will become a family favorite! This post was sponsored by Classico Riserva. All opinions expressed are my own. I love working with brands that I use in the kitchen for myself. Who loves skillet meals as much as I do? They make it so convenient for feeding a busy family each night. Skillet meals happen quite often at our house and they are always a hit with the family. I am always trying to come up with new and delicious skillet meals because they are so popular in our house. I love creating easy meals that are hearty and filling and taste like they came from a restaurant. This recipe has all of those things rolled up into one. I am so excited to be working with Classico Riserva because our family uses it every single time. Classico Riserva delivers restaurant-like quality at a price families can afford. They include only the highest quality of ingredients and has a simple, clean ingredient statement that appear on the front of every jar. They are a great tasting authentic pasta sauce that you can be proud to serve your family for weeknight dinners. The sauce is thick, rich and brought out the very best tomato flavor in this recipe. Their tomato sauces have no artificial ingredients or added sugar. The flavors inside are unreal. I used the roasted garlic sauce in this recipe because garlic is life. Seriously. The roasted garlic flavor was fantastic! You can see all of the quality packed into this jar when you use it for your recipe creation. The thick and rich sauce includes tomatoes, roasted garlic, extra virgin olive oil, spices and sea salt. You are going to have to try this one out. It is amazing! 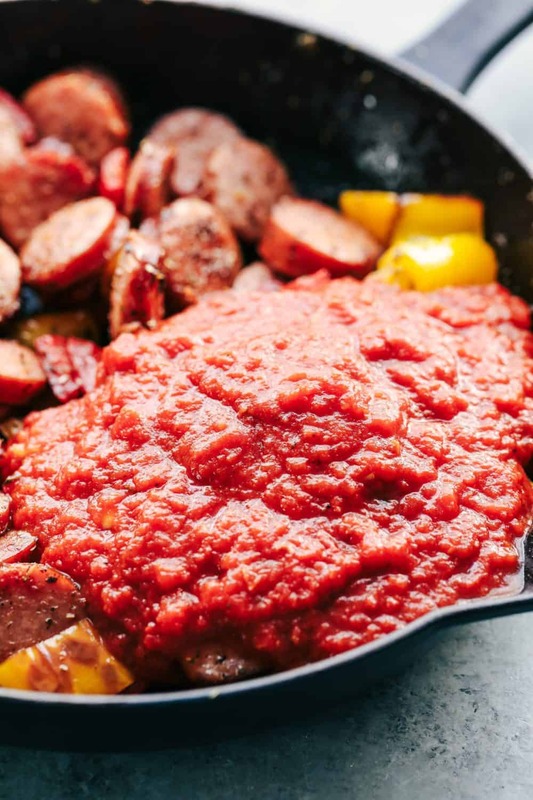 In a large skillet over medium high, cook your sausage and peppers in one tablespoon of olive oil and Italian spices until tender. Add in your jar of Riserva tomato sauce and 3 cups of cooked orzo pasta with the spinach. Allow it to heat through and serve with freshly grated parmesan cheese on top. This meal is so incredibly simple to make and the Riserva tomato sauce allows it to be even easier. 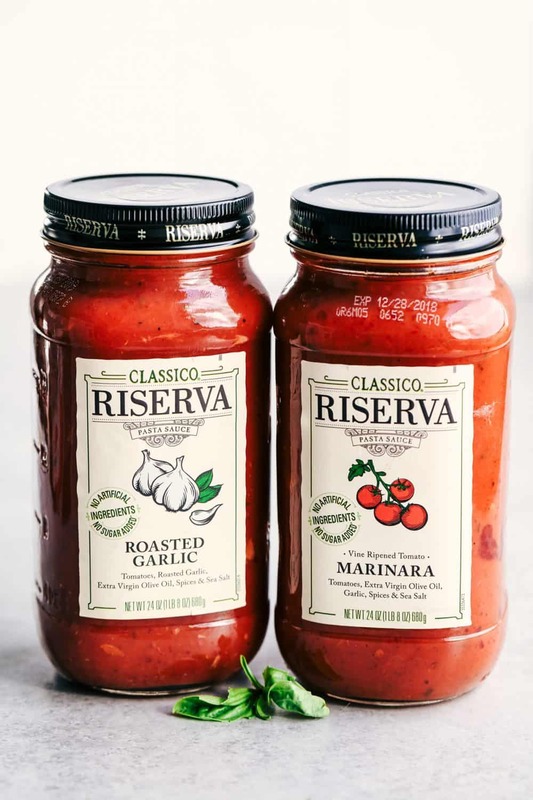 I only trust Riserva in the recipes that I make because it still delivers that quality blend of flavor and spices. 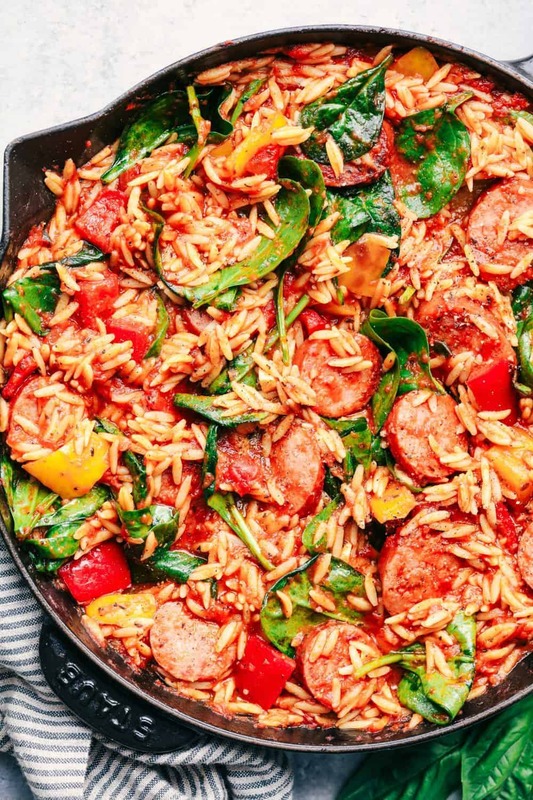 This meal is restaurant quality with so many awesome ingredients coming together in one skillet meal. My family is a huge fan of orzo pasta, especially the kids. This was a great additive to making the meal even more hearty and delicious. This is the perfect all in one meal that I know your family is going to love! 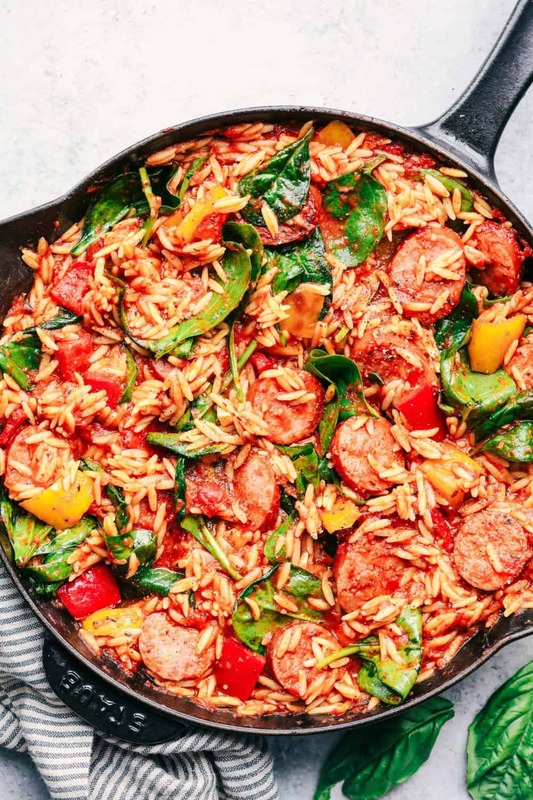 In a large skillet over medium high heat, add olive oil, sausage, bell peppers, and italian seasoning. Cook for about 3-4 minutes until the peppers are tender. Add in the jar of tomato roasted garlic sauce, orzo and spinach. Heat until it starts to simmer and spinach starts to wilt. I have to try this one soon! Thank you for sharing!